NBA point guard, Derek Fisher, is about to switch from player to head coach. In a breaking article at Yahoo Sports, to cite sources, the former Lakers point guard is set to sign a $25 million deal to coach the Knicks. The article reports that after Knicks president Phil Jackson lost his top coaching candidate, Steve Kerr, to the Golden State Warriors, Fisher became Jackson’s primary target and the 18-year NBA veteran will retire to take the job. 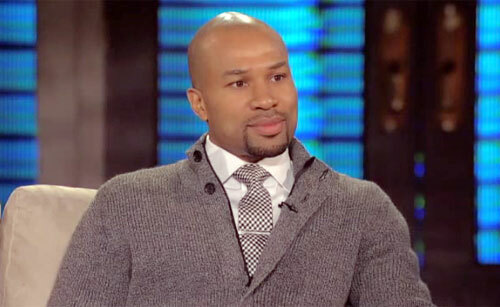 Photo shows Derek Fisher speaking in a 2011 interview with George Lopez. Sources told Yahoo Sports, that Fisher’s coaching staff is expected to include Bill Cartwright and Kurt Rambis. All share longtime coaching or playing experience with Jackson, and Fisher plans to run Jackson’s famed triangle offense with the Knicks. Fisher’s deal matches the five-year, $25 million agreement Kerr reached with Golden State, but is less of a commitment than what New York initially offered Kerr to become its coach. Watch video where ESPN discusses Derek Fisher coaching move. Derek Fisher currently plays point guard for the Oklahoma City Thunder. His professional career has spanned more than 18 years, during which he has won five NBA championships with the Los Angeles Lakers. He has also served as president of the National Basketball Players Association. Sports Speakers 360 is a booking agent for motivational sports speakers.